Rep. Debbie Wasserman Schultz, D-Fla., is not happy with her softball team&apos;s practice rain-out policy. 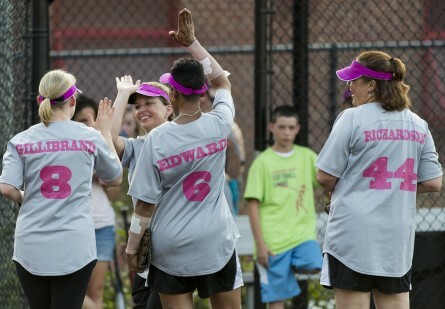 Wasserman Schultz captains the Congressional Women&apos;s Softball team, a group of female lawmakers who play against female Washington press corps members every June to raise money for the Young Survival Coalition, a breast cancer charity. It seems that on Monday evening, the Congressional team&apos;s organizers canceled their Tuesday practice — set for 7 a.m. — in anticipation of rain. But the rain didn&apos;t come. The incident quickly became known as "the bogus call." And so, Wasserman Schultz discussed the policy during votes on the House floor Wednesday, advocating for a rain-out decision the morning of practices. Fellow Florida Rep. Ileana Ros-Lehtinen was nearby and offered her own commentary. "Debbie is gonna make us practice in the rain and I just got my hair done," the Republican quipped. Ros-Lehtinen confirmed the events to HOH. "Absolutely true! I&apos;m getting a ride from Debbie in the morn and I&apos;m doing a rain dance!" she wrote in a Wednesday evening email about Thursday&apos;s practice. "I went to Bubbles this morning for my Comcast newsmakers interview today. Such a loss of a good hairdo manana if it rains!" Wasserman Schultz responded with a comment that made us concerned about the safety of her team. "The Congressional Women&apos;s team will endure rain, snow, sleet or hail, in our pursuit of taking the trophy back from the Bad News Babes," she wrote in an email. The press team prefers a less lightning-rod approach — literally. Press players are not ashamed of the fact that they, and their aluminum bats, stay home during lightning storms. According to Facebook, Thursday&apos;s practice happened and Ros-Lehtinen was in attendance. The game this year is on June 26. Check out the rosters here. You can buy tickets here. Disclosure: The author of this post is a co-captain of the Bad News Babes, the press team.